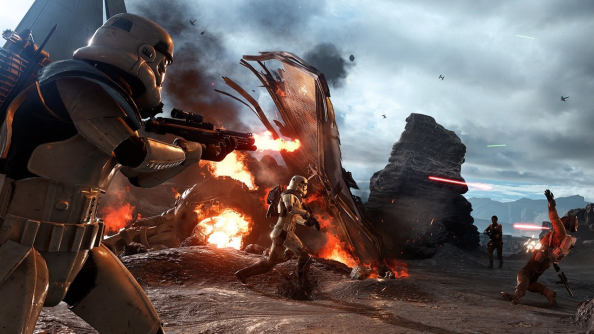 Though DICE have a spotty history with single-player games – on the one hand, Mirror’s Edge, on the other, Battlefield 3 – it was sad to see Star Wars Battlefront’s stellar sound design wasted on basic wave attack modes and not a fully-fledged campaign. What’s the best FPS of all time? We’ve put together what we consider to be the contenders. As it turns out, EA decided against single-player to make sure they could release alongside JJ Abrams’s Episode VII, The Force Awakens. “We made [the choice] due to time and being able to launch the game side-by-side with the movie that came out to get the strongest possible impact,” EA Studios head Patrick Soderlund told investors yesterday. Soderlund didn’t say whether DICE would attempt single-player for the Star Wars Battlefront sequel expected late next year, which will incorporate new characters and settings from the films. But the publishers did pledge to “cure” the series’ lacklustre Metacritic average. “I think the team created a really good game based on the premise that we had,” said Soderlund. “I would say the game has done very well for us and reached a very different demographic than a traditional EA game.